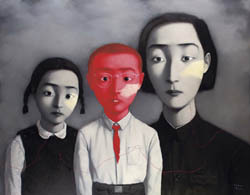 Inspired by family photos from the Cultural Revolution period, as well as the European tradition of surrealism, Zhang Xiaogang’s paintings engage with the notion of identity within the Chinese culture of collectivism. Basing his work around the concept of ‘family’ –immediate, extended, and societal – Xiaogang’s portraits depict an endless genealogy of imagined forebears and progenitors, each unnervingly similar and distinguished by minute difference. 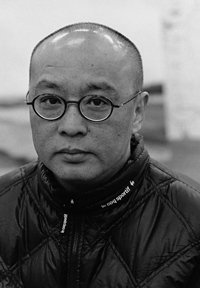 Often painted in black and white, Xiaogang’s portraits translate the language of photography into paint. Drawing from the generic quality of formal photo studio poses and greyscale palette, Xiaogang’s figures are nameless and timeless: a series of individual histories represented within the strict confines of formula. The occasional splotches of colour which interrupt his images create aberrant demarcations, reminiscent of birth marks, aged film, social stigma, or a lingering sense of the sitter’s self assertion. Incorporating the aesthetic of traditional Chinese charcoal drawing, Xiaogang’s style wavers between the exaggeration of animation and stoic flatness. Muted and compliant, Xiaogang’s extended family convey individual identity through their unalterable physical features: too big heads, tiny hands, long noses, and subtle alterations in hairstyle give clues to intimate characteristics and stifled emotions. These dream-like distortions give a complex psychological dimension to Xiaogang’s work, heightening the tension of regulated claustrophobia, and initiating suggestive narrative readings. 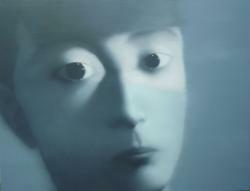 Through his expansive clan of replica characters, Xiaogang questions notions of otherness, difference, and perception. In Bloodline, Xiaogang’s two sitters stare out from the canvas with piercing neutrality, confronting the viewer with an alien gaze worthy of their own unnatural presence; the Asian conception of oneness a stark contrast to the western value of individuality. 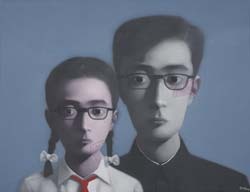 In this portrait, a father and daughter are represented with perturbing similarity, their expressionless androgyny giving them a futuristic air of superiority that can be read as either spiritual enlightenment or malice. Xiaogang’s figures, with their same-same appearance and expression, allude to a disturbing mass psychology. 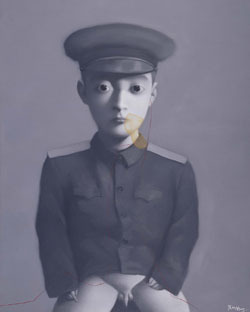 In My Dream: Little General Xiaogang’s image of a boy, dressed in military uniform and naked from the waist down, exemplifies the anxiety between public veneer and private vulnerability, official doctrine and personal conscience. 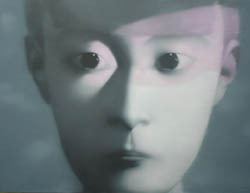 Rendered with a patina aura, Xiaogang’s painting is both dreary and heroic, encapsulating the optimism of a bygone era and its hind-sight failures; the child a nostalgic emblem of corrupted innocence, trapped between the romantic aspiration of the model citizen ideal and its unattainable reality. Xiaogang’s Untitled series magnifies uniformity to uncanny proportions. His paintings of faces, executed in monumental scale, are strangely macabre and dehumanised. Framed with the mug-shot candour of extreme close-ups his figures lack any definitive features; they are the generic archetypes to which all Xiaogang’s figures aspire, triumphs of socially engineered conformity, interchangeable and anonymous. 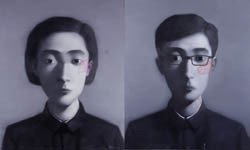 With their visages masked in soft shadows and rendered slightly out of focus, Xiaogang heightens the sense of inconsequential identity; only the eyes are fully illuminated, hollow and clone-like, perfect identikit transplants hallmarking the succession of ductility over will. 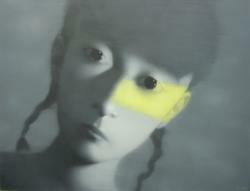 Often restricted to a black and white palette, Xiaogang’s portraits translate the language of photography into paint. Drawing from the generic quality of formal photo studio poses and greyscale hues, Xiaogang’s figures are nameless and timeless: a series of individual histories represented within the strict confines of formula. In paintings such as Comrade, the occasional splotches of colour which interrupt his images create aberrant demarcations, reminiscent of birth marks, aged film, social stigma, or a lingering sense of the sitter’s self assertion.